" In my opinion there is some force in the defenders' contentions regarding lack of specification in the pursuers' averments. By way of illustration, I think that the precise conduct alleged against the defenders themselves could have been more clearly and specifically averred; more could have been said about the degree of audibility of music played at different premises at different times; the same applies to the extent to which copyright works were involved; and explicit averments might have been included as to the defenders having done or authorised infringing acts, or as to their having permitted the use of personal radios in the workplace in the knowledge, or with reason to believe, that copyright infringement was likely to occur. However, looking broadly at the pursuers' averments as a whole, I am not persuaded that they are irrelevant in the sense that, if they were all fully proved, the case would nevertheless be bound to fail. Equally, it does not seem to me that the defenders are currently denied fair notice of the case against them to such a degree that dismissal, or partial exclusion from probation, could be regarded as a realistic option. As characterised in the course of the debate, the pursuers' allegations are of a widespread and consistent picture emerging over many years whereby routine copyright infringement in the workplace was, or inferentially must have been, known to and "authorised" or "permitted" by the defenders' local and central management. If that picture were to be satisfactorily established after proof, it is in my view at least possible that liability for copyright infringement would be brought home against the defenders under either or both of sections 16 and 26(3) of the Act. At this stage, certainly, such an outcome cannot be ruled out, especially in circumstances where the true scope and application of the law regarding the "playing" or "performance" of copyright works "in public" have not been explored in argument. On relevancy grounds, therefore, the pursuers are in my view entitled to the inquiry which they seek. Having reached that conclusion, however, I am not to be taken as accepting that, on proof of the averments in question, the pursuers would necessarily succeed in their claims against the defenders. In the course of the debate various hypothetical situations were figured in which charges of copyright infringement might arguably go beyond the contemplated scope of the legislation and/or offend against common sense. Whether, in the event, any such difficulties materialise in this case will depend on how the evidence turns out at the proof." IPKat is looking forward to the trial, "noting he decision of the Danish Supreme Court in Marius Pedersen A/S v KODA  ECDR 15 that an employer was not carrying on a public broadcast of copyright-protected work even if it supplied its employees with radios and players at the workplace." I'm always on the lookout for IP stories touching children's literature, with Harry Potter disputes being a particular favourite. Well the latest one it appears is that J.K.Rowling is suing the organisers of a Durga puja Hindu religious festival for using a Harry Potter theme in the temporary structure they built to celebrate their goddess. The Puja committee members are at their wits’ end. The organisers claimed they had no clue that they had to seek permission from the author and her publishers. “We will attend the court and are ready to apologise for this mistake,” said Roy Chowdhury. But the organisers also plan to request them to scale down the compensation. The setting at FD Park was almost complete, with the blue tipped Hogwarts castle and the flaming red Hogwarts Express all set to chug off from platform 9-3/4. The designers had planned to place lifesize models of the bespectacled Potter and his companions inside the pandal." IPKat wonders at the validity of the suit. John Lettice - one of the smarter journalists covering the ID mess - has been dissecting the latest ID card system developments over at the Register. "The UK Identity & Passport Service (IPS) has staged an identity landgrab on birth, marriage and death records. From April 2008 the General Register Office, which is responsible for recording these matters and is currently a directorate of the Office of National Statistics, is to become part of IPS, meaning that IPS will be logging you from the moment you're born until the moment you die. The logic of the move is chilling. The UK ID card scheme itself only requires registration for an ID card from age 16, while the passport part of the deal only, obviously, needs to have data on people who have passports. But... IPS has entirely and obviously unfeasible plans to make money by promoting itself to the status of the UK's de facto identity services broker, with passport validation and identity verification services being early manifestations of how it proposes to make money out of this. But if IPS is to be able to grow its offerings from simply checking if a passport is genuine into a general ID verification service, then it makes sense to have everybody in the database, whether they like it or not." EDRI-Gram Number 5.19 has been issued. As usual full of interesting materials. UK: Decrypt data or go to prison! ENDitorial: Montreal Privacy Week: Terra Incognita or Deja Vu? According to the AP via Findlaw a US federal judge has issued an injunction blocking the transfer of a Gunatanamo Bay detainee to Tunisa because of the risk he might be tortured there. "The order by U.S. District Judge Gladys Kessler was unprecedented as a direct intervention in the case of a prisoner at Guantanamo Bay, where some 330 men accused of links to al-Qaida or the Taliban are held, according to a human rights group and the detainee's lawyers. Cynthia Smith, a Department of Defense spokeswoman, said the United States tries to ensure that repatriated detainees are not abused. "Detainees are not repatriated to countries where it is more likely than not that they will be tortured," she told AP in an e-mail. "We take steps to ensure that mistreatment of detainees doesn't happen and upon hearing allegations of mistreatment, we investigate before initiating future transfers to that state." But Human Rights Watch said last month that Tunisian authorities broke a pledge not to mistreat two former Guantanamo detainees who were sent home nearly four months ago. The group cited lawyers for Abdullah bin Omar and Lotfi Lagha as saying the two men were held in solitary confinement and mistreated - despite assurances by the Tunisian government to the United States that the two would not be harmed." ...in an important sense, we have known for two years that, in the government’s view, nothing it does to obtain terrorist information counts as cruel, inhuman, or degrading. Even if Torture Memo 3.0 uses a different argument than Moschella’s, it can’t reach a more radical conclusion. So where is the surprise? Perhaps it’s here: we might have thought that the OLC had cleaned up its act after the Bybee Memo embarrassment. Obviously it didn’t. Apparently, after Jack Goldsmith’s departure, it returned to its previous posture of blessing anything the Administration wants blessed, just the opposite of the candid and independent advice that ethical lawyers are supposed to deliver to their clients. That, as much as the government’s position on CID, is the real disgrace. The OLC issues opinions that are, by custom if not law, binding on the executive branch, so this is not simply legal advice – it’s the equivalent of a secret D.C. Court of Appeals decision. So now the senators are shocked, shocked that gambling is going on in the establishment. Maybe it’s time to start looking at the establishment itself. Is there anything that can be done to restore respectability to the Office of Legal Counsel?" "the Bush Administration is insisting publicly, loudly, indignantly, that the U.S. does not engage in “torture.” Were it only true. What we have engaged in, as has been reported by many sources (see anti-torture memos at this site), is “alternative procedures,” which include water boarding, exposure to very cold temperature, and forced standing for hours on end. Robert Conquest, a venerable sovietologist and favorite historian of conservatives, who Bush awarded the Presidential Medal of Freedom, called these (USSR) tactics "torture," stating that "Torture is...a worse crime against humanity than killing.” If these sorts of actions were “torture” when the Soviet Union engaged in them, they are “torture” when we do them. Deny, Deny, Deny. Hide behind a silly legalistic argument about the meaning of “torture.” But it doesn’t change what we did. [I optimistically use the past tense]. The victims of atrocities must not be erased." Whatever you think of Bill Gates and Microsoft, he certainly puts a lot of effort into good causes through the Bill and Melinda Gates Foundation. Their latest initiative is an attempt to get out from under the constraints of the usual funding process for medical research, something university researchers across all the disciplines divides (not just in medicine and pharmaceuticals) will universally welcome. "Creative, unorthodox thinking is essential to overcoming the most persistent challenges in global health. Two hundred years ago, the first vaccines were developed because revolutionary thinkers dared to try an entirely new approach to preventing disease. The power of innovation is also at work in countless other fields, from space travel to the Internet. In spite of the important role that innovation plays in advancing scientific ideas, the global health research community has tended to play it safe, driven mostly by consensus, with funders avoiding high-risk proposals that test altogether novel concepts. This has resulted in incremental progress that, while valuable, is unlikely to deliver major leaps forward. In response to the need to cultivate imaginative ideas in health research, the Bill & Melinda Gates Foundation announces a new grants initiative, Grand Challenges Explorations. The initiative aims to encourage scientists worldwide to explore innovative ideas that could lead to breakthroughs in some of the greatest health challenges facing poor countries. Grand Challenges Explorations will foster early stage innovation in global health research and will expand the pipeline of ideas that potentially could merit further evaluation. Grand Challenges Explorations is an expansion of the foundation’s commitment to the Grand Challenges in Global Health initiative, which was launched in 2003 to accelerate the discovery of new technologies to improve global health. To date, the foundation has provided $450 million to support more than 40 projects on topics such as making childhood vaccines easier to use in poor countries and creating new ways to control insects that spread disease. “The scientific community has shown tremendous interest in the Grand Challenges initiative, and the projects funded so far are beginning to show important progress,” said Dr. Harold Varmus, president and CEO of Memorial Sloan-Kettering Cancer Center and chair of the scientific board that oversees the Grand Challenges in Global Health initiative. “The new Explorations initiative will help to further increase innovation in global health research.”"
They are, in addition, planning to fast-track the research grant applications and approvals process. The test will be to see how it all works in practice but I wish them and the experts whose work they facilitate every success. Even the Wall Street Journal approves. According to Groklaw, Microsoft chief, Steve Ballmer, is keen for the free and open source software community to embrace software patents. I neglected to report that Larry Lessig won his first case earlier in the Autumn (5 September to be precise). "The 10th Circuit decided our appeal in Golan v. Gonzales today. In a unanimous vote, the Court held that the "traditional contours of copyright protection" described in Eldred as the trigger for First Amendment review extend beyond the two "traditional First Amendment safeguards" mentioned by the Court in that case. It thus remanded the case to the District Court to evaluate section 514 of the Uruguay Round Agreements Act (“URAA”) under the First Amendment, which removed material from the public domain. The opinion by Judge Henry is well worth the read. The argument was one the best I have seen. All three judges knew the case cold. It is a measure of how good courts can be that they took such care to review this case." The decision is indeed worth reading and basically says the Eldred decision stands - tough - but there are serious questions relating to freedom of expression that need to be taken into consideration when works are removed from the public domain by changes to copyright laws. interferes with their First Amendment right to free expression. of the CTEA claim as foreclosed by the Supreme Court’s decision in Eldred v.
the URAA has not exceeded the limitations inherent in the Copyright Clause. interests in works removed from the public domain to require First Amendment scrutiny of § 514. On this limited basis, we remand for proceedings consistent with this opinion." by foreign composers like Shostakovich and Stravinsky. He contended that the removal of some of these works from the public domain, due to changes in US copyright laws, led to higher costs to him for performance fees, royalties, sheet music rentals etc. The theory being that when these costs are too high they interfere with his first amendment rights to freedom of expression. The US courts tend to like to avoid the free speech v copyright conflict so it is something of a surprise that this decision accepts there is a problem. Who will mourn the passing of copyright? Ian, now that Radiohead have decided to release their latest album on the web for whatever price their fans are willing to pay, wonders who will mourn the passing of copyright. He's certainly generated a flurry of discussion on the ORG list, which sadly I haven't had the time to keep up with recently. "One might argue that the windfall to authors of existing copyrights has a positive consequence, by providing them with more resources for additional creative projects. However, this argument ignores the profit maximization decision of a producer, which takes into account the producer's cost of capital for a given investment. In general, a profit-maximizing producer should fund the set of projects that have an expected return equal to or greater than their cost of capital. If a producer lacks the cash on hand to fund a profitable project, the producer can secure additional funding from financial institutions or investors. If the producer has resources remaining, after funding all the projects whose expected returns are higher than the cost of capital, this remainder should be invested elsewhere, not in sub-par projects that happen to be available to the firm. If a producer pursues the same set of projects in any event, then its incentives will not be improved from the mere fact of a windfall from consumers." [...] it's exhausting having to argue such basic economic points as the benefits of competition at a meeting of supposedly free-market political activists." William Heath likes Anthony Jay's new theory of bureaucracy. "Once you have a large bureaucracy, say several hundred people who have little or no contact with customers patients, passengers, pupils, or parents or whatever, it becomes a staff welfare system. All the impetus for the staff is to improve their welfare and reduce their worry. It becomes all about overseas trips, important lunches, important car parking spaces at the expense of customers, larger offices, more assistants, reduction of opportunities to be blamed, bonuses and special payments. The main job of management has to be to counter this tendency. The motivation of management in the competitive world is that if they fail they lose their job and the company fails. But in government monopoly bureaucracy this spur is removed. The purpose for which the bureaucracy was founded ceases to become an objective. Instead, it beomes a constraint." In commenting Patrick Dunleavy doesn't wish to be solipsistic (someone who believes they themselves are the only object of real knowledge) but reckons his own theory on bureau-shaping "covers much of the same ground, but better." Whilst Ian notes James Buchanan's nobel prize for public choice theory. Jay is a little harsh in describing the process as a staff welfare system. What happens in large bureaucracies is that it becomes risky at a personal level to act in the interest of the customer or the organisation, in a way that is not prescribed by organisational procedures. Staff who get burnt once too often, for looking after customers by breaking procedures, eventually conform. It is more a risk aversion or safety seeking process than a staff welfare system. So people acting rationally in their own self interest do not always lead to the emergence of benefits for the system as a whole, contrary to popular belief. 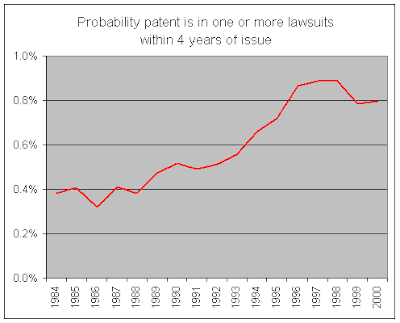 Technology Innovation and Intellectual Property (James Bessen) reported recently that the probability that a patent is the subject of a lawsuit within four years of being granted increased hugely between 1984 and 2000. "This trend implies an increasing “litigiousness” on the part of patent holders and it suggests that patent holders are incurring greater litigation costs per patent. But it also means that prospective innovators have to wend their way through a minefield with many more patents and many more of those patents are likely to “explode” into lawsuits." "Mike Scherer tells the story of the interplay between political interests, policy and economics research over the last two decades, including the Bayh-Dole Act, the Hatch-Waxman Act, the creation of the Court of Appeals for the Federal Circuit and the role of US in TRIPs negotiations." form of propaganda. Suggestions for further policy reforms are offered." Indymedia UK has heard from Alisar Usmanov's lawyers on the thorny subject of online defamation. "The notice served to Indymedia charged Indymedia with publishing allegedly libellous accusations about Usmanov, one of the richest men in Russia, recently linked to a possible hostile takeover of Arsenal FC. The author of the posting, Craig Murray, is a former UK ambassador to Uzbekistan and claims to have inside knowledge of the businessman’s allegedly illegal dealings. Murray was sacked by the UK government for exposing the Uzbek government’s use of torture to attain ‘intelligence’ information, and for exposing and criticising UK-US support for a vicious dictator in pursuit of resources."